By way of a reintroduction, I’ll address what’s probably the most common question I receive from non-earthquake-scientists asking about what I do here: “Wait, you moved from California to the UK to study earthquakes? !” Most recently this has been accompanied by the suggestion that it must be a rather easy job to have taken up, as I’d basically get to sleep through work like a lifeguard at the Olympics or the proverbial California weatherman. The California Geological Survey’s map of shaking hazard, showing the highest ground motions expected to be experienced in a 50-year period. Here the color scale ranges upward from approximately 0.2g to the full acceleration of gravity. 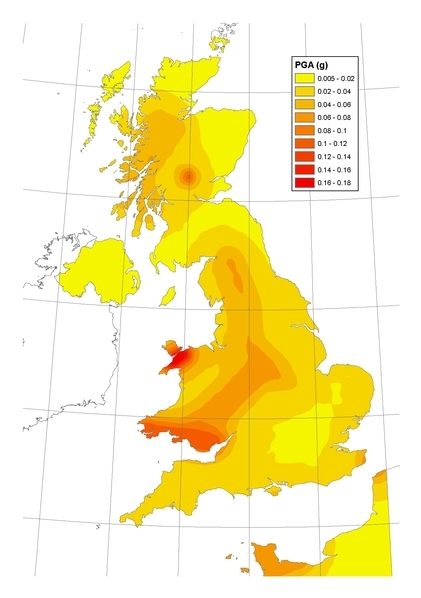 The British Geological Survey’s seismic hazard map of the UK. Note that the highest ground motions represented on the scale don’t even reach the minimum values on California’s map. But of course it’s important to note that seismology–“the study of shaking”–itself is a global affair, with our first and most fundamental knowledge of earthquake phenomena coming from recordings by sensitive instruments of distant tremors from halfway around the globe. It’s not just the wiggle-watching seismologists who get to study earthquakes on the other side of the planet from their comfortable desks; those of us who study earthquake deformation–geodesists and geomorphologists–also have the tools to monitor and evaluate earthquakes from afar. As I highlighted last year, responding to earthquakes from space is basically routine now thanks to an ever-growing array of Earth Observing satellites. Rapid imaging of contemporary earthquakes obviously provides timely information about unfolding natural disasters, while it also enables opportunistic scientific study of broader topical phenomena with a great deal of detail. But coming from a tectonic geomorphologist’s perspective, I’m also excited about our new ability to tap into the rich records of earthquakes long past, as regular, high-resolution satellite imaging of our planet captures gory detail of the scars it still bears from earth-rending seismic events tens to hundreds to thousands of years ago. For my current postdoc, I’m working among a collection of big UK centres to exploit the tools of Earth Observation for the purpose of understanding the seismic hazard facing continental interiors. My projects, under the purview of the Centre for Observation and Modelling of Earthquakes, Volcanoes and Tectonics (COMET), combine the aims of LiCS (Looking Inside the Continents from Space) and EwF (Earthquakes without Frontiers) to relate seismicity past and present to the distributions, rates, and dynamics of strain in the Earth’s crust… and vice versa. Read up on their blogs–EwF maintains one full of field research and updates about topical earthquakes, and COMET produces a steady flow of interesting research, and in the coming weeks and months I’ll highlight more of the things we and they are doing. Welcome back to the glimpses I can bring you of the trembling Earth. P.S. For clarification, what I don’t do is study earthquakes in the UK. They happen, but they’re not generally of a size that geomorphologists get to enjoy.